SNK has posted a countdown on their official Japanese website with "SNK New Game" in the web address. The text "A New Dawn Rises..." appears alongside the countdown, which is set to end next Monday, Sept. 10th, 2018. SNK Global and KOF14 Art Director Nobuyuki Kuroki both posted the link and tweeted: "New SNK Game Announcements". Is a new Garou or a Samurai Shodown on the horizon? Is it even possible more than one new game will be announced? 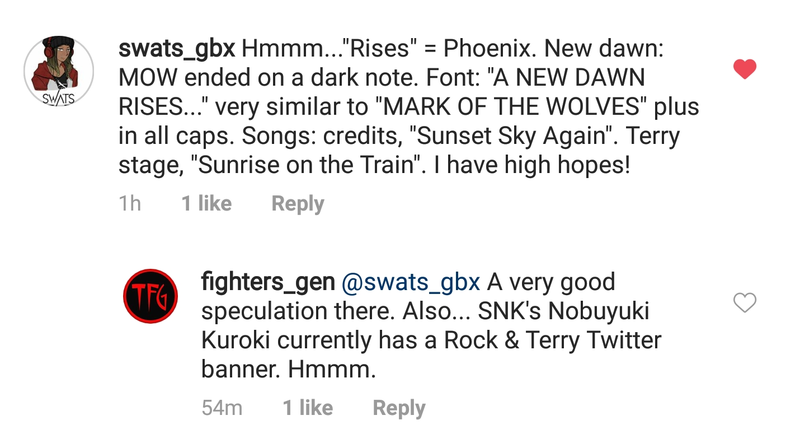 The reason for the second question are the tweets by SNK Global / Nobuyuki Kuroki - which read Announcements (plural). However, the official website's title states "New SNK Game Announcement"... so we'll probably go with that. There aren't many hints to go on currently... but one point of interest I happened to notice is Kuroki Nobuyuki's Garou: Mark of the Wolves Twitter Theme - which currently features 2D sprites for Terry Bogard and Rock Howard from Garou: MOTW (seen below). Is this just a simple coincidence? ...or not? In addition, here's an interesting speculation worth reading courtesy of TFG Instagram member, swats_gbx, regarding today's news... just to get you thinking. Of course, let's keep our expectations in check... because in recent years, SNK has also announced a variety of Japan-only Pachinko gambling games based on SNK franchises. That said, this countdown website doesn't "guarantee" a new console game or even a new fighting game. [UPDATE] SNK has announced a new Samurai Shodown planned for a 2019 release! Stay tuned on FightersGeneration.com for full coverage of Samurai Spirits (2019).